Consider the hypothetical Smith family. Susan Smith is a teacher in Lexington’s schools. Lexington pays 85% of health premiums for GIC health insurance plans with good coverage. Susan’s husband, Jim Smith, is an engineer at IBM. IBM offers similar health plans to Lexington’s, but contributes less than 85% to premiums making the rational choice for the Smiths to enroll in a Lexington, not an IBM, family health plan: an IBM plan would cost the Smiths more than a Lexington plan for similar coverage. Net result: Lexington, not IBM, pays $15,000-20,000 in annual health costs for the Smith family, in effect a subsidy by Lexington’s budget to IBM for the employer portion of health costs that IBM doesn’t pay for its employee, Jim Smith. 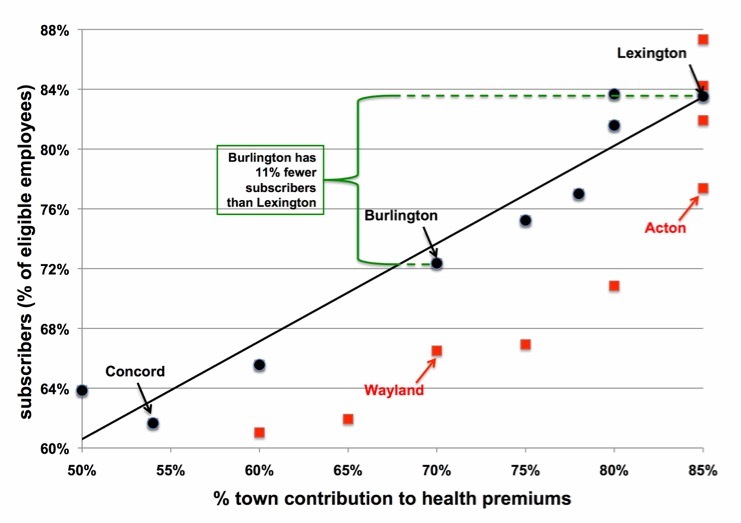 The proportion of benefits-eligible employees (usually employees working 20 or more hours per week) who actually subscribe to municipal health plans (vertical axis) correlates closely with each Town’s contribution rate to health premiums (horizontal axis). The correlation is a straight line where each black dot is a Town (red dots are Towns with fewer subscribers than the straight line predicts: some, like Wayland, offer cash incentives to their employees to not take the Town’s benefits). A mathematical model developed in 2011 used this straight line to predict what would happen if (1) Lexington lowered its then 85% contribution to health premiums closer to 50% while (2) increasing salaries across the board to maintain (or increase) our employees’ total compensation, yet encourage them to take their spouse’s employer family plan, not Lexington’s. The model shows that Lexington would save $2.3 million annually in 2011 (per cell O61 in the 1st tab of this spreadsheet; per cell O58, each Lexington employee would receive a +$7,000 annual salary increase). In 2015-16, Lexington instituted a “cash plan” whereby an employee dropping a family (resp. individual) plan received $5,000 (resp. $2,500) in cash. As Boston-area towns reported in 2010, this cash plan yielded minuscule results: 37 family and 9 individual plans (the latter by employees under age 26 taking their parents’ plan under “Obamacare”) were dropped, saving Lexington’s budget a net $246,000. Employees view such “cash plans” as temporary; only a permanent across-the-board salary increase combined with a reduction of the town’s 85% contribution to health premiums will yield the large, $2.3 million per year, savings that are possible. In short, Lexington taxpayers now unnecessary subsidize other Boston-area employers. Before asking for another tax increase, the Town should negotiate with our unions the implementation of a permanent win-win approach. Every Lexington employee will be better off, and the Town will save about $2.5 million annually.